Human nature is very strange! On one hand, we know that almost everything in the world falls in a shade of grey. It is comparatively tough to find something pure white or black. Still, we tend to distinguish things as pure white or black. Based on which side of the event, incident or thing we are! So based on the one who narrates the incident, the representation of the same tends to be different. But, why we are talking about human nature and how we tend to see things now? 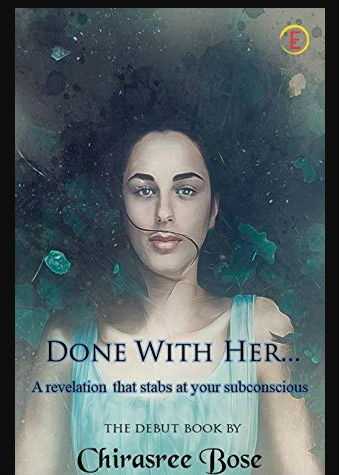 Well, recently I got a chance to read Done With Her… a dark romance thriller, from our team and the book leads to such feelings. When we were approached by the author for the book, we were not quite sure about what to expect from the book and whether we would like to read it or not. The dark romance thrillers are meant for the adult (especially mentally) readers only. So, that was also one of the points we were considering. However, some nice aspects of the book convinced us to share our views and reviews with you all. Though the book is provided by the author, the review is unbiased, uninfluenced, genuine and personal, as always. A book cover plays a significant role in book reading and/or purchase decisions. So let us take a look at the book covers. Well, it is not a typo. This book has different covers for Kindle Edition and Paperback edition. In fact the fonts of Title are changed recently in the cover page of the Kindle edition. The effect of having different covers in different versions of the book on book sales is a debatable thing. Having the same cover definitely gives a uniform look to all the versions of the book. At the same time, changing a cover page is easier for Kindle version of the book, but for the print edition, it can be done only at the time of reprinting or new edition. Anyway, the cover page of Kindle edition has black background reflecting the darkness of the story and the title in the blood red color tries reflecting the essence of the story. The thicker font version for the title is more effective here. The illustration of the girl is imposed quite effectively. The setting sun gives the desired effect to the cover. Overall, not a very impressive yet moderately appealing cover page. The cover page of the paperback edition is more appealing. It has an illustration of a girl’s face which is almost emotionless but sadness is still quite visible on her face. A thoughtful imagination by the cover designer. The illustration is tried to embed with some foggy elements to give it a mysterious look. It makes the girls face look like she is drowning (there is no water in the illustration though). Do let us know which version of the cover page you like more and what you think about each of them! Avesh found a good job in a metro city and thus he shifted there. Belong to a wealthy family, Avesh was expected to do something else, however, he was allowed to follow his dreams. He was given remarkable resources by his family to stay at, which, he couldn’t afford otherwise (based on his job). At job he sees Spreeha and got mesmerized with her. The girl also reminded him of someone else he used to know! He was, however, convinced that Spreeha has not even a remote link to the girl he used to know. Living a youthful life in an independent world where no one is there to keep him in check, it was obvious for him to get attracted and desire Spreeha. Unfortunately, Spreeha is already associated with someone! And, that someone also has a link with Avesh. Destiny often plan something so unusual that you think of it as a possible conspiracy! Avesh discovered that Spreeha lives in a home in his neighborhood. Actually, he can see Spreeha’s balcony straight from his window! So, does destiny want Avesh and Spreeha to get connected and fall in for each other? What will happen to the person she is already associated with? Or, Avesh is just daydreaming something which is not actually possible? Well, you need to read the book to get all the answers. The book is a good short thriller where you meet Spreeha, Avesh, Shivansh, Chanda, Dheeraj and Rita among others. The way these characters are linked with each other is one of the positive attributes of the book. The author is good at wordplays and she is able to write good scenes. For example, here is a simple line of describing the state of a character is written in an interesting manner. The tiny beads of sweat on his temples start to streak his face. Thinking that a dark romance thriller may not have any philosophical or catchy lines will disappoint you in this book. Here is one interesting line which is perfectly balanced in terms of reality, philosophy and life-lesson. When your actions are driven by your weakness, you tend to give yourself away. Do you love reading James Bond novels and enjoy quick witty lines in the same? Well, you can get something similar in this book as well :). 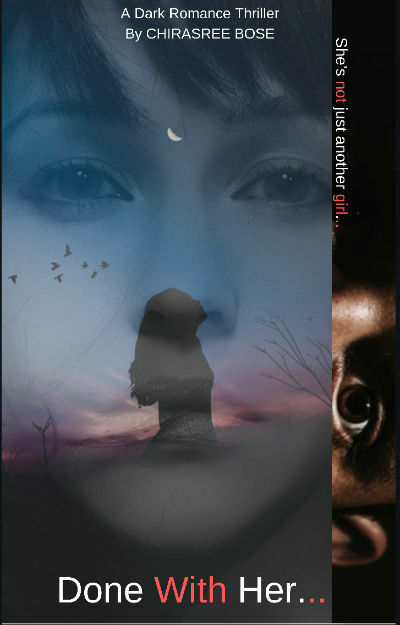 That girl may or may not be harmful… but a secret always is. While most people tend to admire White colors, the author advocates brilliantly for the black color! And, she does it in a convincing manner. Black is blamed for its downright honesty. It’s bold, it’s gutsy, it has nothing to hide. White is appreciated for the blanket it spreads over the wrong, the bad and the undesired. So many things it hides behind the brightness of itself. Whereas black, if you look deep enough, is made of them Just look deep enough… into darkness… away from brightness. You’d see all that you want to. Darkness… you need to look into darkness, Rita. … Light often blinds your vision. You don’t see what you want to. You see what it wants to show you. I stab at the mobile screen, my mind zipping faster than my fingers. Sometimes you don’t need a bunch of words and number of lines to tell what you want to. Here is a good example of how a situation is explored in this book. He stares, his cry now muffled. The essence of the book lies in the last few paragraphs and I really like some of them. However, in order to avoid spoilers and keep your reading experiences intact, I need to avoid mentioning them. I, however, would include this line which conveys a significant part of the message the book tries to convey. You cannot live by definitions, rules and protocols set by others. Live by your own. The book is a short and thrilling read, and, by now you must have got an idea of the quality of writing you can expect in the book. The book is strictly meant for adult readers and there are some adult scenes and cuss words are there. Personally, I consider it as a negative point of the book. However, it is quite possible that for dark romance thriller lovers it may not be the case. I, will not recommend this book to any underage fellow. Also, you can look out for a good promotional offer to find the right time to purchase it. The paperback version comes with additional shipping cost (when I am writing this), so you should settle for Kindle Ebook version, if possible. A book with good linguistic attributes, strictly limited for adult readers who enjoy this genre. If you fall in this category, you will enjoy reading it.